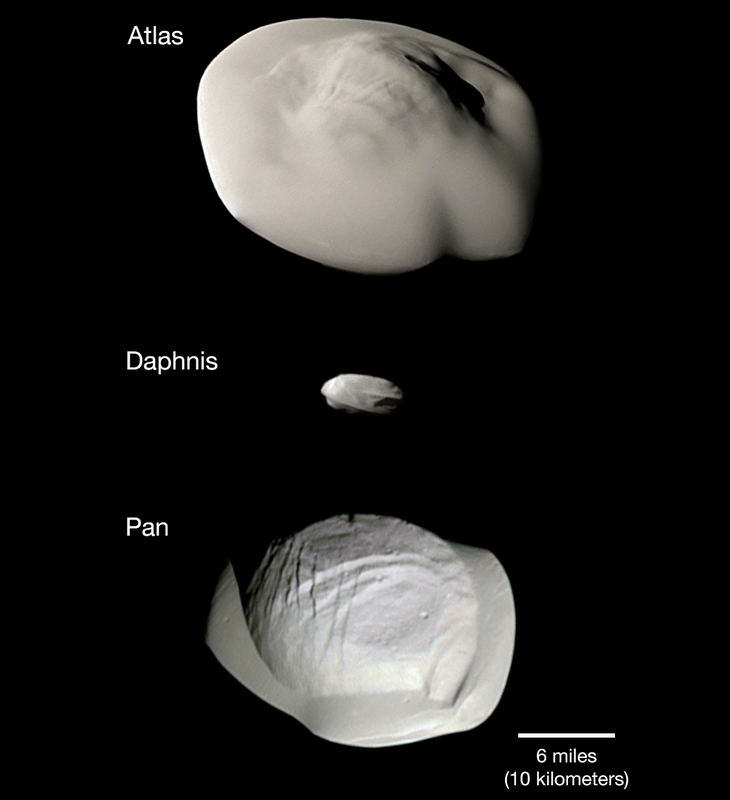 June 29, 2017 – This montage of views from NASA’s Cassini spacecraft shows three of Saturn’s small ring moons: Atlas, Daphnis and Pan at the same scale for ease of comparison. Two differences between Atlas and Pan are obvious in this montage. Pan’s equatorial band is much thinner and more sharply defined, and the central mass of Atlas (the part underneath the smooth equatorial band) appears to be smaller than that of Pan. A version of the montage using only monochrome images is also provided here. All of these images were taken using the Cassini spacecraft narrow-angle camera. The images of Atlas were acquired on April 12, 2017, at a distance of 10,000 miles (16,000 kilometers) and at a sun-moon-spacecraft angle (or phase angle) of 37 degrees. The images of Pan were taken on March 7, 2017, at a distance of 16,000 miles (26,000 kilometers) and a phase angle of 21 degrees. The Daphnis image was obtained on January 16, 2017, at a distance of 17,000 miles (28,000 kilometers) and at a phase angle of 71 degrees. All images are oriented so that north is up.